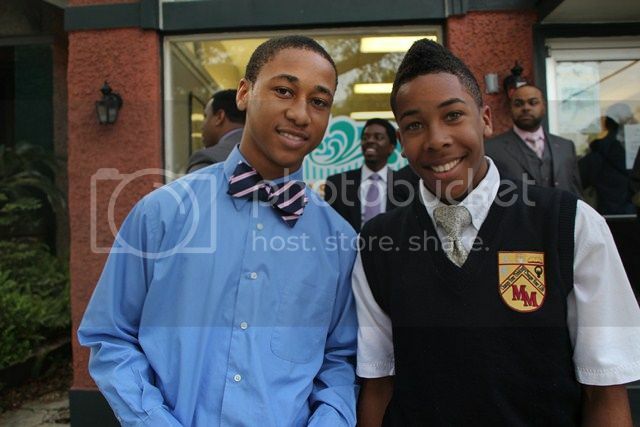 Mentees participate in a tie-tying ceremony at Chill's Barbershop in New Orleans, the subject of the award winning documentary film "Close Ties: Tying on a New Tradition." Every January the nation observes National Mentoring Month, and over the years we've profiled many organizations and individuals leading the mentoring movement. Mentoring has been shown to encourage positive choices, promote high self-esteem and support academic achievement. It is also used as a proven delinquency prevention strategy. However, despite these benefits many organizations across the country are struggling to recruit black men to serve as mentors to black boys. For insight on this, we spoke to Stephen Powell, executive director of Mentoring USA and David McGhee, a former program director of Big Brothers Big Sisters Greater Flint to get their thoughts on this challenge. Celebrities are also lending their support to mentoring. Author and talk/radio show host Steve Harvey launched mentor recruitment drives in partnership with the Open Society Foundations' Campaign for Black Male Achievement and Big Brothers Big Sisters, and Susan L. Taylor has connected over 125,000 mentors with more than 130,000 children through the National Cares Mentoring Movement. And we can't forget about our young girls, as negative portrayals of women in the media and the increasing number of black girls in the juvenile justice population tells us where renewed focus should be. You'll find below our most popular posts on mentoring. To learn more about National Mentoring Month, visit www.nationalmentoringmonth.org and to find a mentoring program near you, visit www.mentoring.org. New York Urban League's First Annual Men's Empowerment Day provided 120 high school males the first chance to get an inside view of some of New York City's most renowned companies. Unlikely Brothers: The Blind Side meets Push in this poignant memoir about two lives forever altered by the bonds of friendship. This book beautifully showcases the benefits of a mentor/mentee relationship. Close Ties: Tying on a New Tradition: A documentary that highlights Black males and mentoring in New Orleans. Mentoring to Manhood: A mentoring program founded by black males in Prince George's County, Maryland is featured. Steve and Marjorie Harvey Foundation presents 3rd Annual Girls Who Rule the World Mentoring Weekend: The event gathered over 100 young women ages 13-18 from Atlanta and surrounding areas for an impactful, empowerment-filled weekend that addressed vital issues and life experiences to spark dialogue, bolster their dreams, self-confidence and success for the future. Life Pieces to Masterpieces Transforms Lives Through the Arts: An innovative Washington, DC based arts-based organization that engages African American boys and young men (called apprentices) to channel their life experiences using the creation of acrylic collage paintings, original poetry, prose, oratory, movement/dance and music. Concerned Black Men National Partners with Urban Retailer DTLR on Mentoring Initiative: CBM CARES® and DTLR employees mentor a group of young men at a Washington, DC public charter school in this year-round mentoring effort. Visible Men Hosts "Golf & Giving" in Support of Black Males: Highlights of an event hosted by Visible Men, a national success network for black boys and men.